What happens when unique skeletal and cultural evidence from a prehistoric world appear long before they should — and in places where they should not…? Brad Steiger asks. It is rather amazing that such sophisticated people, as we judge ourselves to be, do not even know who we are. And it becomes rather dismaying to discover that there is a great deal of suppressed, ignored, and misplaced pre-historical cultural evidence that would alter the established interpretations of human origins and provide us with a much clearer definition of what it means to be human. Archaeologists, anthropologists, and various academicians who play the “origins of Man” game, reluctantly and only occasionally acknowledge instances where unique skeletal and cultural evidence from the prehistoric record suddenly appear long before they should — and in places where they should not. These irritating artefacts destroy the orderly evolutionary line that academia has for so long presented to the public. Consequently, such data has been largely left buried in site reports, forgotten storage rooms, and dusty archives. Although the Leakeys, that eminent family of anthropologists, have offered dramatic new evidence that the “homo” lineage goes back at least three million years, the academic consensus holds that an ancestor of modern man evolved about one million years ago. Homo Sapiens, the “thinking man,” our own species… became the dominant planetary life form on a worldwide basis about 40,000 years ago. It is difficult enough to explain the sudden appearance or influx of Homo Sapiens at that time, but it is an even more complex question to ponder why Neanderthal and Cro-Magnon man correspondingly disappeared. And just when Richard Leakey is adding to a growing body of evidence that mankind developed in Africa, a Hungarian excavation surrenders a Homo Sapiens skull fragment in a context more than 600,000 years out of alignment with the accepted calendar of man’s migrations across the planet. The Creationist may present an extreme point of view when he maintains that the world is roughly only 6000 years old and that man himself is only a few days younger, but what happens to evolution when there are such sites as the one in Australia, which yielded Homo Sapiens (modern man), Homo erectus (our million-year-old ancestor), and Neanderthal (our Stone Age cousin) in what appears to be a contemporaneous environment? Then there is the Tabun site where Homo Sapiens fragments were found in strata below (which means older than) classic Neanderthal bones. This is but one of several digs that has produced evidence of modern man before what is accepted as one of his predecessors. 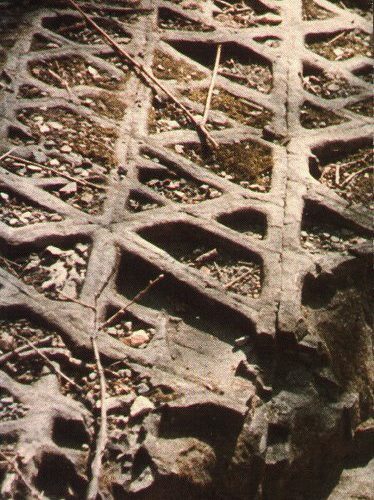 But just as we are trying our best to fit skeletal fragments together in a manner that will be found acceptable to what we believe we know about our origins, pre-Adamite footprints are being found, which, if they are what they appear to be, will make total shambles of our accepted evolutionary calendar. 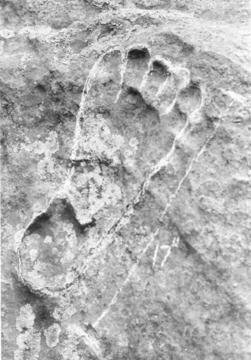 In Pershing County, Nevada, a shoe print was found in Triassic limestone, strata indicative of 400 million years, in which the fossilized evidence clearly revealed finely wrought double-stitching in the seams. Early in 1975, Dr. Stanley Rhine of the University of New Mexico announced his discovery of human-like footprints in strata indicative of 40 million years old. A few months before, a similar find was made in Kenton, Oklahoma. At almost the same time, a similar discovery was revealed in north-central Wisconsin. At Glen Rose, Texas a 16-inch hominid footprint was next to dinosaur tracks in contemporaneous strata, thereby suggesting that man may have outlived the giant reptiles by 80 million years. If man lived at the same time as the dinosaurs, he might have been a king-sized fellow to better confront the gigantic reptiles. Skeletal remains of surprisingly large human beings have been discovered all over the Americas, from Minnesota to Nicaragua. The skeletons average in size from seven to over eight feet tall — and none of them are carved “Cardiff” hoaxes. For one thing, corn, a New World contribution to the pantries, is said to be, at 9000 years, our oldest domesticated seed crop. Some earliest agriculturist had to be on this continent more than 9000 years ago in order to domesticate the seed. Conclusive proof that such ancient farmers did exist was offered when a Humble Oil Company drill brought up Mexican corn pollen that was more than 80,000 years old. The anomalous Indian blood seration and dentition and the geographic distribution of the American Indian demands an impossible genetic time scale in which to transform Asiatic immigrant to distinctive New World inhabitant. Even if we attempt to keep some kind of peace with the accepted theories of New World habitation, we must grant more evolution in 40,000 years in North America than that which took place in more than one million years in Europe, Africa, and Asia. We might rest our case by providing as evidence the 50,000 year-old skulls found in California, which are clearly those of American Indians, but we are left with another mystery. A 140,000 year old American Indian type skull (via metric analysis) has been found at an Iranian excavation site. What enormously complicates the above finding is the uneasy fact that no precedent or prior skull types of the American Indian have been found anywhere in the world. The Amerindians appear without any evolutionary transformational base. The sites of the mysterious Mullions also offer no end of trouble to conventional timetables and esteemed evolutionary structures. The Mullion culture suddenly appeared approximately 10,000 years ago along the Algerian coast with the largest skeletal population in the entire prehistoric record. In addition, the Mullions also possessed the largest cranial capacity of any population the world has ever known — approximately 2,000 cc versus our present 1,400 cc. Whoever the Mullions were, they inhabited the site only briefly, and their population consisted mostly of women and children, who worked with tool types and domesticated animals never before seen. As we shall see again and again, we have such a limited knowledge and practically no understanding of the worlds before our own. For example, who walked the streets of that remarkable ”minicivilization” in Yugoslavia? Whoever strode the boulevards of those now silent cities were once citizens of a culture that flourished before ancient Egypt and China — 5000 years before the glory that was Greece. 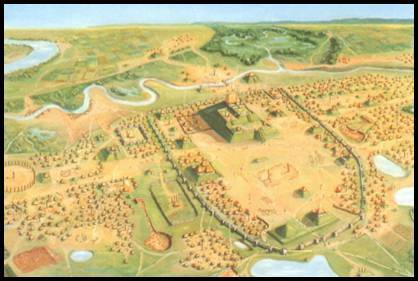 What of the lost Amerindian civilization of Cahokia, complete with pyramids and a great wall? One site, near the present city of St. Louis, may have contained a metropolis of more than 250,000 North American Indians. And who constructed the mysterious seven-mile walls of the Berkeley and Oakland, California, hills? Or the stone wall that runs for 20 miles near Petra in Jordan? And which pre-Mayan peoples engineered an elaborate waterworks in Yucatan to irrigate crops over 2000 years ago? And orthodox pooh-poohing to the contrary, the pyramids do hold many mysteries. No one has ever really answered the anomalies of the Egyptian and Mexican pyramids; no one has truly dated them; and if we accept established theories for their construction, no one has explained how the earliest and smallest populations could erect the largest architecture. Scientific knowledge has seemingly been prized by certain inhabitants of every culture, known and unknown. Rock engravings, which may be as old as 60 million years, depict in step-by-step illustrations an entire heart-transplant operation and a Cesarean section. These 150,00 engraved stones also portray scenes indicating that a very special race of man actually lived at the same time as the prehistoric monster reptiles. The ancient Egyptians used the equivalent of contraceptive jelly and had urine pregnancy tests. The cement used in filling Mayan dental cavities still holds after 1500 years. The Caracol Tower at Chichen Itza is a remarkable Mesoamerican observatory that seems to have correlated its findings with similar sites in North America, including Mesa Verde, Wichita, and Chaco Canyon. No fabric is supposed to have been found until Egypt produced cloth material 5000 years ago. 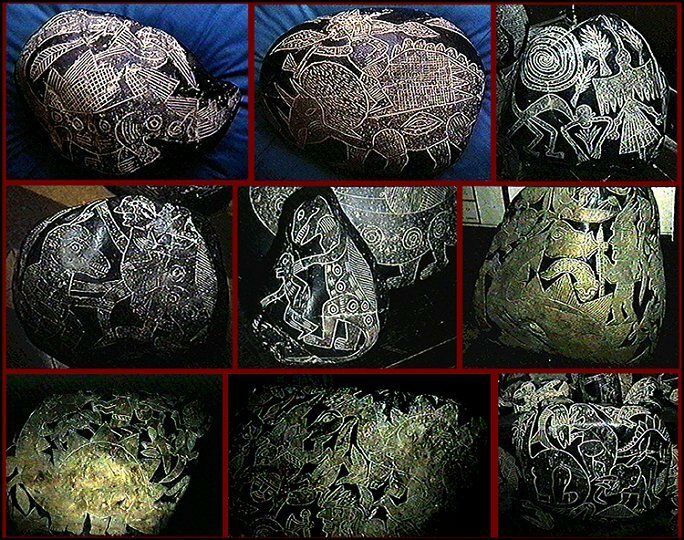 How, then, can we deal with the Russian site which provides spindle whorls and patterned fabric designs more than 80,000 years old? Not only did the ancient Babylonians appear to use sulfur matches, but they had a technology sophisticated enough to employ complex electrochemical battery cells with wiring. There is also evidence of electric batteries and electrolysis in ancient Egypt, India, and Swahililand. There is evidence of a metal-working factory of over 200 furnaces which was found at what is now Medzamor in Russian Armenia. Although a temperature of over 1780 degrees is required to melt platinum, some pre-Incan peoples in Peru were making objects of the metal. Even today the process of extracting aluminum from bauxite is a complicated procedure, but Chou Chu, famous general of the Tsin era (265-316 A.D.), was interred with aluminium belt fasteners on his burial costume. Relics found embedded in solid rock or in ancient, undisturbed strata are called “erratics” The discoveries of these erratics suggest a vast antiquity for man’s existence on this planet. Carved bones, chalk, stones, together with what would appear to be greatly ornamented ”coins,” have been brought up from great depths during well-drilling operations. A strange, imprinted slab was found in a coal mine. The artifact was decorated with diamond-shaped squares with the face of an old man in each ”box.” In another coal-mine discovery, miners found smooth, polished concrete blocks which formed a solid wall. According to one miner’s testimony. he chipped one block open only to find the standard mixture of sand and cement that makes up most typical building blocks of today. Two hypotheses may explain the presence of these perplexing artifacts, these “erratics”: 1) that they were manufactured by an advanced civilization on Earth which, due either to natural or technological catastrophe, was destroyed before our world’s own genesis; 2) that they are vestiges of a highly technological civilization of extraterrestrial origin, which visited this planet millions of years ago, leaving behind various artifacts. Even if a highly advanced extraterrestrial race might have visited this planet in prehistoric times, it seems unlikely such common, everyday items as nails, necklaces, buckles and vases would have been carried aboard a spacecraft deposited in such widely separated areas; for erratics have been found in North and South America, Great Britain, the whole of Europe, Africa, Asia, and the Mid-East. The question of just what exactly may have happened to these worlds before our own is one that invites a great deal of highly speculative thinking. In spite of the general unpopularity of catastrophism, there does seem to be a number of recently discovered “proofs” of ancient cataclysmic changes in the Earth’s crust which may account for the nearly total disappearance of these prehistoric worlds. Geological evidence indicates that these changes were both sudden and drastic might have completely overwhelmed and destroyed the early inhabitants and their cultures. Perhaps the most potentially mind-boggling evidence of an advanced prehistoric technology that might have blown its parent-culture away is to be found in those sites which ostensibly bear mute evidence of pre-Genesis nuclear reactions. In earlier writings I told of the “fused green glass” found deep in the strata of an archaeological dig. The statement that such material had been known previously only at nuclear testing sites (where the sand had melted to form the substance) proved to be an unsettling thought for many readers. But throughout the planet, in the same geologic strata, there unequivocally exists areas which scientists state are strongly suggestive of nuclear reactions. Could it be possible that these sites provide evidence of a prehistoric nuclear war? ”Fused green glass” has been found in such sites as pierrelatte in Gabon, Africa; the Euphrates Valley; the Sahara Desert; the Gobi Desert; Iraq; the Mojave Desert; Scotland; the Old and Middle Kingdoms of Egypt; and south-central Turkey. At the same time, scientists have found a number of uranium deposits that appear to have been mined or depleted in antiquity. This excerpt was taken from: Steiger, Brad. “Worlds Before Our Own.” New York: Berkley Publishing Group, 1979 obtainable from http://www.anomalistbooks.com/steiger2.html. Housed in a warehouse in Ica, Peru, is a collection of stone tablets which carry pictures portraying advanced medical practice. The tablets were first seen and recorded by Father Simon, a Jesuit missionary who accompanied Pizarro in 1525. Amongst other scenes portrayed are pictures of what appear to be Caesarian surgery and blood transfusions as well as the use of acupuncture needles and detailed images of what appear to be open heart surgery. The tablets are not just anomolies: they open a Pandora’s box of questions and challenge everything we have been taught about our past. It is becoming increasingly evident that our notions of human history are not simply mistaken but in need of a total overhaul. The evidence is beginning to mount to the point where it can no longer be ignored; all across the planet archaeological finds are being made that are distinctly at odds with the conventional notions of humanity’s past and point to a revolution in the way we see ourselves and our origins. Over the last two centuries various archeological finds have been unearthed which do not fit into the conventional time-scale of pre-history; these so-called archeological anomalies have largely been buried in site reports or left to gather dust in museum storage rooms. However the sheer volume of these finds and the very nature of some of them calls for another look at the worlds before our own. Academic consensus maintains that the ancestor of modern man emerged one million years ago. Whilst modern man, homo sapiens, only emerged as the dominant planetary life form some 40,000 years ago; this is generally the line held by conventional archeologists and anthropologists, in spite of the fact that there is considerable evidence to the contrary. Thus we have the case of the metal spheres found by miners in the Western Transvaal, South Africa. Over the past few decades miners in the area have come across metal spheres, often grooved, in layers of sedimentation estimated at 2.8 billion years old. According to Roelf Marx, curator of the Klerksdorp museum where they are kept: “The spheres are a complete mystery. . .They’re nothing like I have ever seen before.” Moreover the spheres are so hard that they cannot be scratched, even with a hard metal point. In 1979 several were closely examined by J.R. McIver, professor of geology at the University of Witwatersrand in Jo’burg and Andries Bischoff, geology professor at Potschefstroom University. What they found only deepened the mystery; averaging 1 to 4 inches in diameter the spheres are usually coloured steel blue with tiny flecks of white fibers embedded in them. They were found to be made of a nickel-steel alloy which does not occur naturally, and is of such a composition that excludes any meteoric origin. Quite simply they do not fit into any conventional prehistoric time-scale. Likewise an early Paleolithic skull on display in London’s Natural History Museum would seem to defy all conventional archeology. Dated at 38,000 years old and excavated in 1921 in modern Zambia, the skull bears a perfectly round hole about a third of an inch in diameter on its left side. Opposite the hole, the cranium is shattered, and reconstruction of the fragments show that the skull was smashed from the inside out, as if from a bullet wound. Forensic experts who have examined the skull all agree that the cranial damage could only have been caused by a high speed projectile. So the fact that the skull was excavated from a depth of 60 foot, of mostly lead rock, only deepens the mystery. Just as baffling is the case of an iron pot found in a block of coal. Thus according to an affidavit made by Frank J. Kenwood in 1912: “While I was working in the Municipal Electric Plant in Thomas, Okla, in 1912, I came upon a solid chunk of coal which was too large to use. I broke it with a sledge hammer. This iron pot fell from the center, leaving the impression or mould of the pot in the piece of coal. . .I traced the source of the coal and found that it came from the Wilburton, Oklahoma, Mines.” According to Robert O. Fay of the Oklahoma Geological Survey, the Wilburton mine coal is about 312 million years old. “As I started to timber the room up,” Mathis continued, “it caved in; and I barely escaped. When I came back after the cave-in, a solid wall of these polished blocks was left exposed. 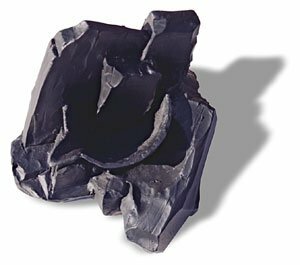 About 100 to 150 yards farther down our air core, another miner struck this same wall, or one very similar.” The coal in the mine was probably carboniferous which, according standard dating methods, would mean that the wall was at least 286 million years old. The Illinois State Geological Survey noted in 1984 that the age of deposits at 120 feet in Whiteside County varies greatly; in some places, they might only be 50,000 years old, whilst in other places one would find Silurian bedrock 410 million years old. And still, the evidence of world’s before our own continues to grow. Despite Mathew’s dismissal, Reid persisted: “I next got hold of a micro-photographer and an analytical chemist” wrote Reid: “The micro-photo magnifications are twenty times larger than the specimen itself, showing the minutest detail of thread twist and warp, proving conclusively that the shoe sole is not a resemblance, but is strictly the handiwork of man. Even to the naked eye the threads can be seen distinctly . . .I will add that at least two geologists . . .have admitted that the shoe sole is valid, a genuine fossilization in Triassic rocks.” It should be added that the Triassic period is now generally dated at around 213 – 248 million years ago. Some of the archeological anomalies discovered, like the above, are quite prosaic and certainly not the product of a hi-tech civilization. However some very obviously are the vestiges of a technically very advanced culture; like the minute spiral shaped objects unearthed in the Eastern Urals which bear a remarkable resemblance to cutting edge nano-technology, as detailed in earlier stories. Elsewhere similar evidence has been unearthed which points to scientific and technical knowledge existing long before it was previously assumed. In 1938, Dr Wilhelm Kong, an Austrian archeologist, was rummaging around the basement of a Baghdad museum when he came across a six inch high pot of clay. The pot contained a cylinder of sheet copper which was soldered with a 60-40 lead-tin alloy, whilst the bottom of the cylinder was a crimped-in copper disk sealed with bitumen. Another insulating layer of bitumen sealed the top and held in place an iron rod suspended into the centre of the copper cylinder. With a background in mechanics, Dr Kong immediately recognized that what he was looking at was, in effect, a battery. What was unusual though was that it had been unearthed from an archeological site dated 2000 years old, whilst other similar artifacts had been recovered from sites dated as far back as 5000 years. 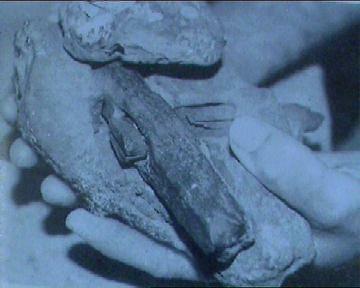 These latter were unearthed from Sumerian remains in southern Iraq and dated to at least 2,500 BC. That’s long before Michael Faraday is said to have discovered electromagnetic induction and the laws of electrolysis in the early 1800’s. So the million dollar question is: were these artifacts the forerunner of Faraday’s discovery . . . or the vestiges of a technically advanced civilization? And if these artifacts were the remnants of an advanced civilization then there follows the Billion dollar question: what exactly happened to this civilization? Could it have been that it was engulfed in some kind of nuclear Armageddon? Evidence indicative of nuclear explosions has been discovered across the planet in the form of “fused green glass” found deep in the strata of various archeological digs. Usually only found at nuclear testing sites, the glass has been unearthed at various archeological digs as far apart as Gabon, Africa, the Gobi Desert and Scotland. Is it possible that a previous civilization was destroyed by a nuclear conflict? Could it be that a handful of survivors emerged from the ruins of a nuclear apocalypse and then, over millennia, slowly rebuilt civilization? Or could there be another reason for these anomalies. Whilst we accept that the above may well be a possibility we would suggest that there maybe other explanations. We would suggest that shifting crustal displacements could be a critical factor here. This theory, first postulated by Charles H. Hapgood and subsequently backed by no less than Albert Einstien, was outlined by Richard Noone in the ‘Hammer and the Pendulum’, featured previously. More than that though we would suggest that this scenario has occurred not just once but on a number of previous occasions; indeed what we are looking at is a cyclic pattern, a pattern that has embossed itself across the face of unrecorded human history. As Richard Noone described in his article the event would be dramatic and cataclysmic, triggering a geological Armageddon; across the planet there would a wave of earthquakes, floods and volcano’s as the planets rigid crust suddenly shifted and tore itself asunder. And for those few who were not killed in the initial shocks there would only be a desperate struggle to survive in the ruins of a shattered civilization. Stripped of everything that they had taken for granted they would be left with nothing but memories of the former civilization. And then a few generations later there would little else but stories of a golden age and a great flood that had destroyed everything in its path. As the millennia passed so too would the memories and stories fade, until one day millennia later there would be little else but legends of a fabulous civilization and stories of a mythical flood. And maybe, just maybe, a few archeological anomalies that would one day baffle future scientists. Sources include: The Hidden History of the human race, The condensed edition of Forbidden Archeology, Michael A. Cremo and Richard L. Thompson, World’s Before Our Own, Brad Stieger. 5-5-2000, Richard Noone.